Miss.Africa Effort led by DCA Academy, is revealing a Seed Fund in Africa that will use grants to support ladies and ladies in the Science, Innovation, Engineering and Mathematics (STEM) fields to release or broaden their own efforts that will increase their digital chances in IT associated training, tasks and management functions. The program has an interest in finding out about effective activities. that are presently supporting ladies and ladies in STEM, and through this. effort, we determine how we may support scalability and their effects. The 2019 Seed Grant for the quantity 5 Thousand United States dollars ( USD 5,000) will help the winning effort to begin or broaden their capability. A 2nd classification of One Thousand United States Dollars(USD 1000) will be given as a reward for 2 other candidates from emerging African nations that produce more socio-economic worth for ladies by efficiently leveraging tech chances. — Existing citizen of an African nation (consisting of North and Sub-Saharan Africa). — Application needs to be sent in English. — Using as a specific (a minimum of 18 years of age), or a.
agent of a non-governmental company (NGO) or social. — Capability to show previous experience performing activities. supporting ladies and ladies in computer technology or STEM fields. — Dedication to establishing and adding to a virtual neighborhood for supporting ladies and ladies efforts. — Shown management capacity (recommendations will be needed for those obtaining management funds). — Proposed tasks MUST have a concrete effect for ladies and ladies in computer technology and/or STEM- associated fields. Choice will be provided to tasks that target under-served. populations and areas, take a collective technique, have a high. possible for development and provide an ingenious usage of innovation. 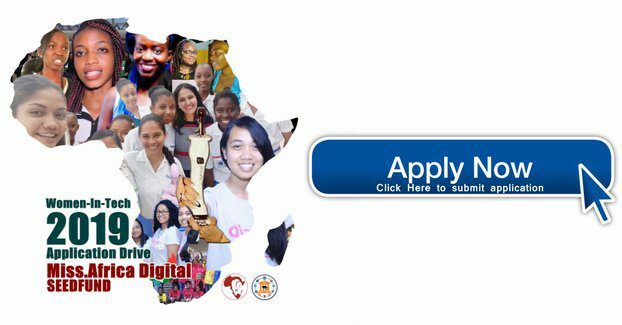 September 2019: Round IV of Miss.Africa Digital grants revealed.